Colorado Peak Politics | THE HICK WE KNOW AND LOVE: Why Aren’t Female Candidates Asked about Putting Men on the Ticket? THE HICK WE KNOW AND LOVE: Why Aren’t Female Candidates Asked about Putting Men on the Ticket? Short answer: Because they’re always on the ticket. Of course, Bash responded by reminding him that there hasn’t been even a female vice president yet. We get what he’s saying, but in this era of “me too” and on a station that caters to left of center viewers, we have to ask whether his question makes any sense whatsoever. But it may have revealed something about Hick’s ambition. Was he posturing for a veep position? Maybe, maybe not. Even if he was, it may be irrelevant. Other than being the state’s most famous bartender, we’re not sure what Hick brings to the table. 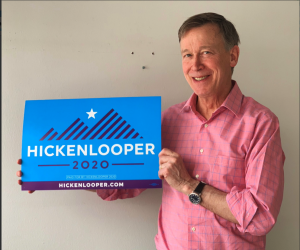 Colorado votes are already going to the Democratic candidate. He’s maybe a capitalist on days where his poll numbers are up, but truly in this field, he’s just another white dude and his competitor, Beto O’Rourke, has a billionaire father in law to help pick up his tab.